It’s been just over a week since the end of #24in48 and your hosts are just now picking themselves up off the book-strewn floor to provide an update on the ‘thon. We’ve got just a little bit of business to get through, before I announce the winners of the four prize packs. I appreciate everyone’s patience if you won a prize; as I noted in the post-readathon email you received, unless there is an issue (or your prize requires you to choose something) you will NOT hear from us confirming which prize you won. With close to 150 prize winners, I just can’t email everyone individually. Also, if you haven’t filled out the closing survey yet, please go do so (in particular, we’re interested in how the readathon can improve for next time). Now, for your prize pack winners! (Winners, you should expect an email hitting your inbox shortly). Congrats to all of the winners and thank you to the prize sponsors who made these prize packs possible. If you have any additional questions or suggestions, please drop us an email and we’ll get back to you as soon as we can. Otherwise, prize winners, keep an eye on your mailboxes! WE DID IT! We made it the full 48 hours! I’m so thrilled for every last one of you. More than 1,300 readers participated this weekend and I hope you all had a great time. 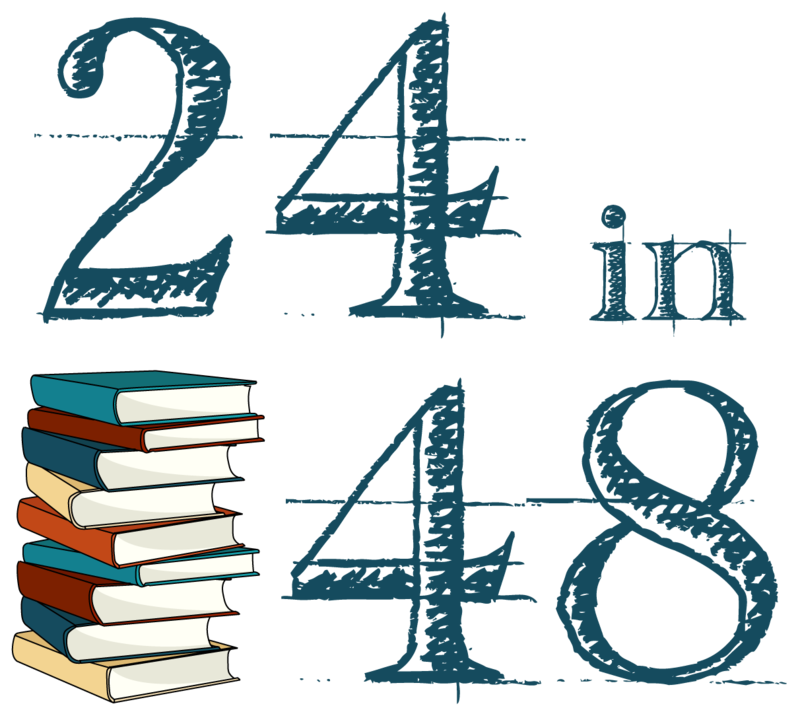 Since I know you’re all dying to mark your calendars, the next 24in48 readathon will be on…. Lastly, if you finished a full 24 hours of reading, you’re eligible to win one of four amazing prize packs. Fill out this form, including your proof of hours read, before midnight ET on Tuesday, July 25th. Thanks once again for joining me and my fellow co-hosts Kristen and Kerry. It’s been a great time. Hour 45: Yew Kan Dew Eet! A super quick reminder to double-check all the previous posts to see if your name has been announced as a prize winner this weekend. If it has, you’ll need to go hit up the Prize page and make your selections. And if you’ve hit the 24-hour mark or think you’re going to, don’t forget that you’ll need to record proof of your time in the Hour 48 post after this thing is all over and you’ll only have two days to do so. And don’t forget you’ve got three more hours to enter the Hour 42 Literary Dinner Party Challenge. Time for the last door prize winners of the readathon, and one more shout out to all of our amazing prize sponsors for providing such great giveaways. Give them a thanks when you can! This wouldn’t be possible without them. Three hours to go, kids! You got this! One of the very best parts of readathon is the food (trust me on this). I am all about planning my snacks and meals in advance, and the name of the game is, ALL THE CARBS. I try to eat healthy, I promise, but then again, mac & cheese exists in the world. It’s only a problem if you say it’s a problem, right? Post a comment with your dinner party guest list; you have until Hour 48 at midnight ET tonight to enter. Congrats and head over to the Prize page now to pick your swag. Hour 39: Read Your Pants Off! Don’t forget, you can still post your bookish swag photos in the Hour 36 challenge for another three hours. We’ve still got plenty of prizes up for grabs, so let’s give away some more! I’ll see you back here in three hours! I LURVE good bookish stuff. Like, absolutely adore it. (If you needed proof of my adoration, check out my weekly Book Fetish column over at Book Riot.) My closet is practically overflowing with the literary tees and totes (seriously, Rach, how many bookish tote bags do you need?) But I can’t stop, won’t stop. Some of my favorite bookish swag enablers (ahem…retailers…) have been kind enough to donate some amazing prizes to this round of readathon, and I figured I can’t be the only one that loves their bookish swag. For this hour’s challenge task, post a picture in the comments with all your best bookish gear. Mugs, tees, totes, jewelry, show me what you got! This challenge will be open until Hour 42. It’s noon on the official readathon clock. Which sounds like prize time to me. Here are the challenge winners from our Hour 24 Spine Poetry challenge. We’re 3/4 of the way done, people! You can do it! You wouldn’t think that you’d be sleepy first thing in the morning, but then you do the 24in48 readathon and you realize that you can be sleepy and/or hungry ANY TIME. So start your day with some simple stretches or a little exercise to get your blood flowing and help you stay awake and ready to go for the rest of the day. Throw an audiobook in your ears and take a walk or run or do a simple vinyasa yoga sequence if that’s your thing. I like these if you’re looking for something new. Whatever you do, I promise you’ll feel better once you’ve gotten your heart rate up. Know what else gets the heart rate up? Winning some prizes! Here are a few more door prize winners. If you’ve won, don’t forget to go over to the Prize page and pick your spoils in the form. And don’t forget you’ve got another three hours to enter the Hour 30 Spine Poetry challenge!